Modern day Betsoft releases have been some of the best video slots we have reviewed here at Fruity Reels with their latest project Rook’s Revenge potentially topping them all. The game fits nicely into the coveted slots3 range, which is an established portfolio of video slots form Betsoft that utilise their patented 3D gaming software. Each video lost in this category is brimming with special animations and graphics that are as close to ‘HD’ as possible. Back to the slot and Rook Revenge is based around the Aztec tribesman who is seeking retribution by any means necessary. The entire story fits into a 20-payline, 5-reel structure that prides itself of providing a host bonus rounds, features and a top prize of an enormous 12,500 coins. This boldly named pokie certainly warrants a double take at first glances, showing some really cool yet crazy designs and animations. The team at BetSoft have certainly made sure that they have released this game with only the highest quality features and this can be seen from the off. The genuine looking design accompanies the grand animations that are in action before you even take a spin. Hitting a winning line will really does bring the slot to life, making objects jump from the screen in a thrilling way. The games wild comes in the shape of a golden question mark symbol and as usual substitutes for all of their symbols within the game, regardless of payout size. The sneaky Chieftain ‘Rook’ takes centre stage during the base game as he is always jumping into life and seemingly having a dance at any possible moment. 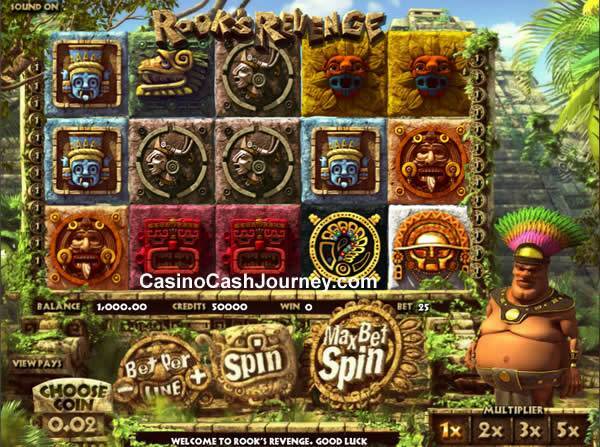 The symbols presented in the game include ancient Aztec masks and stone carvings, with the usual Betsoft characteristic ‘crash, bang, wholop!’ proceeding each and every win. The advantage of the symbols causing such a commotion when included in a winning line is that they then explode, making way for a fresh set of symbols to replace them. This type of feature has been known under many named in different video slots, however the outcome is always the same: a stack more wins! Remember also that each wining sequence players are lucky enough to hit is rewarded with ever increasing multipliers. The avalanche will start the ball rolling with a x1 with each increasing tumble increasing the counter to 2x, 3x and 5x respectively. Rook Revenge is a really exciting video slot with lots to offer during the base game. This is where the fun ends in fact as there isn’t much in the way of bonus rounds unfortunately. Rook Revenge is part of Intercasino’s vastly expanding video slot range.